So I have been gone for a while, with good reason- I have been off at camp for the week getting happily sunbaked and exhausted [Tangent: That will get get a whole picture-laden post when I get all my proverbial ducks in a row (and far from looking what those unrowed suckers look like now...a "clusterduck" if you will.)] and while I was away, guess what - I took my first steps in years! Oh, haha. Psych. I didn't really walk, silly geese of the internet. Don't you think "that girl in the wheelchair" suddenly taking steps for the first time in 20 years would warrant a tweet, a Facebook post or some kind of vermin raining from the skies [Tangent: Is that a thing in the Bible? I am the most cursory of Catholics...so I couldn't tell ya.]. One night, while trying to fall asleep out in the boonies with spotty to zero internet access [Tangent: Seriously, this scenario will make anyone realize how reliant they are on late night Facebook scanning.] I searched the every GB of information and software on my iPhone. After clicking on the never investigated little red and white heart icon added with a recent update, I found something completely crazy. 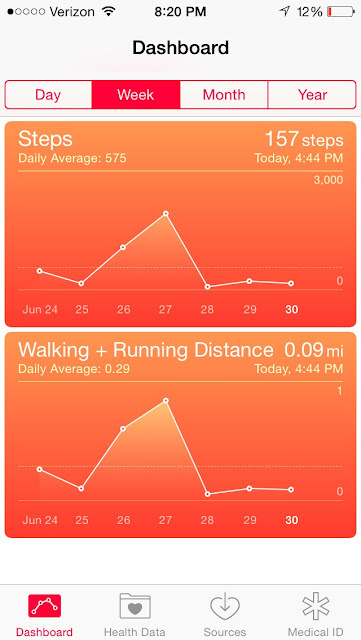 Somehow, I had fooled my iPhone's little pedometer into thinking I was taking steps. Sure...it's not an impressive amount. I'm no Vanessa Carlton. [Tangent: Sorry that was the lamest reference ever. Please excuse it.] I am a hell of a long way from posting my daily fitbit readings on Instagram to hoards of people that don't give a damn, but checking my "steps" is my new obsession. I'm no tech expert so I am not completely clear on how these dohickies work [Tangent: I can only deduce that my crap tires on my wheelchair make me jolt and bounce around a lot, which simulates a step. ], but I love that I have outsmarted the ghost of Steve Jobs and answered "Yes" to the eternal question "Can someone in a wheelchair use a pedometer without actually walking?" Lazy people of the world who wish to seem athletic, take this new information and run with it as you wish [Tangent: Pun not intended. ].